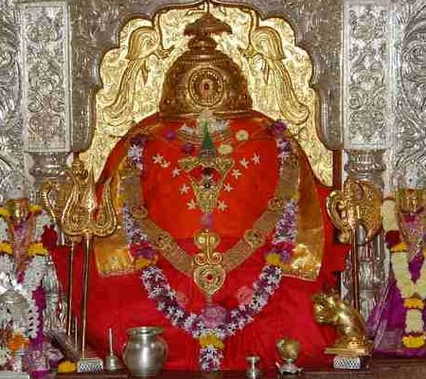 The Shree Siddhivinayak Temple at Siddhatek is a Hindu temple dedicated to Ganesha. 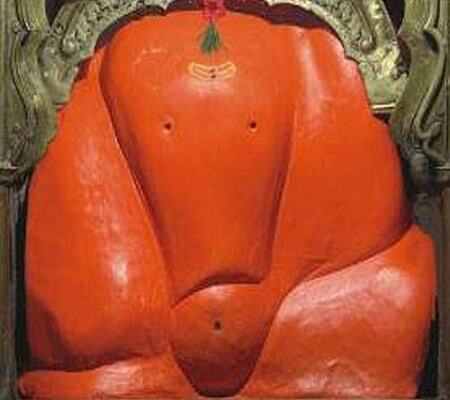 The temple is one of the Ashtavinayaka, the eight revered shrines of Ganesha in the Indian state of Maharashtra and the only Ashtavinayaka shrine in Ahmednagar district. The Siddhivinayak Temple is the second Lord Ganesha Temple to be visited during the Ashtavinayak Temples Yatra/Pilgrimage/Tour according to Shastras. In the events or Ganesh Jayanti days, lots of small shops here for shopping and the sweet Prashad (Pedha) of Ganesha. To propitiate the deity, devotees often perform pradakshina (Circumambulation) of the hillock seven times, even though there is no paved road and the path passes through thorny shrubs. The temple stands on a hillock, surrounded by thick foliage of Babul trees and is located approximately 1 km from the core Siddhatek village. The Siddhivinayak (Ganesha) enshrined in the Siddhivinayak Temple is said to be the one who is capable of granting Siddhi (spiritual power). 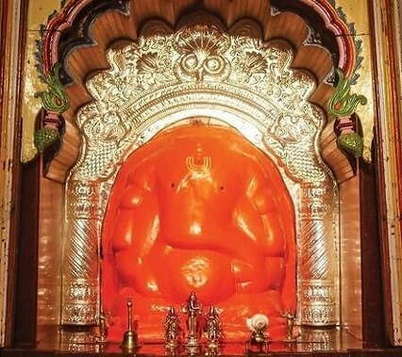 It is believed that it was here on the Siddhatek Mountain, that Vishnu acquired Siddhi and as such the idol of Lord Ganesh here is called as Siddhivinayak (Siddhi: 'spiritual power', Vinayak: Lord Ganesha Name ). 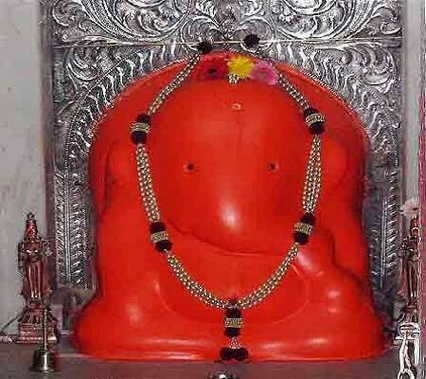 Located on the banks of river Bhima, this Ashtavinayak Temple of Ganpati is situated in the remote village of Siddhatek, about 200 km east of Pune, in the Karjat Taluka of Ahmednagar district, Maharashtra and 20-22 km. away from Dound. The temple is accessible from the small village of Shirapur in Pune district, on the southern bank of the river, from where it can be reached by boat or newly constructed bridge. Legend says that Lord Brahma, with the blessings of Lord Ganesha, was occupied in making the world. While this was going on, Lord Vishnu felt snoozing and the two devils, Madhu and Kaitabha, rose up out of Vishnu's ears. They began alarming all divine beings, goddesses and sages. On understanding that just Lord Vishnu could execute the evil spirits, Lord Brahma and different Gods asked for him to slaughter them. In spite of the fact that Lord Vishnu quarrelled for over 5000 years, he bombed in overcoming the evil presences. On the guidance of Lord Shiva, Vishnu venerated Lord Ganesh. Vishnu was then effective in executing the evil spirits with the gifts of Lord Ganesha. Thus, where Vishnu performed compensation and picked up Siddhi is known as Siddhatek and Lord Ganesha, who gave Siddhis, is known as Siddhivinayak. Buses are available from Pune and Daund to a village called Shirapur, which is a kilometre away from Siddhatek. From there, one can get on a boat to reach the temple. An alternate route is the long route of 48 km from Daund-Kashti-Pedgoan. In the morning some buses ply from Pune directly to Siddhtek. Daund Junction Railway Station, which is 18 km away, is the nearest railway station on the Pune - Solapur line. Mumbai Hyderabad Express, Jhelum Express, Nanded Pune Express, Mumbai Nagercoil Express, Konark Express and Udyan Express passes through Daund Junction Railway Station. Siddhatek to Lenyadri Distance: 31 min (15.1 km) via Narayangaon - Junnar - Siddhatek Road, Fastest route, The usual traffic. Siddhatek to Ranjangaon Distance: 1 hr 49 min (65.3 km) via Narayangaon - Siddhatek Road, Fastest route, the usual traffic. Siddhatek to Theur Distance: 2 hr 47 min (90.0 km) via NH60 Highway, Best route. This route has tolls. Siddhatek to Siddhatek Distance: 3 hr 57 min (150 km) via MH (Maharashtra) SH 50 (State Highway), Fastest route. Siddhatek to Morgaon Distance: 3 hr 25 min (135 km) via Shirur - Satara Road, Fastest route, the usual traffic. Siddhatek to Pali Distance: 4 hr 7 min (171 km) via NH60 Highway and Bengaluru - Mumbai Highway/Mumbai Highway/Mumbai - Pune Highway/Mumbai - Pune Expressway, Fastest route, the usual traffic. This route has tolls. Siddhatek to Mahad Distance: 3 hr 13 min (137 km) via NH60 Highway and Bengaluru - Mumbai Highway/Mumbai Highway/Mumbai - Pune Highway/Mumbai - Pune Expressway, Fastest route, the usual traffic, This route has tolls.